Today I'm delighted to welcome my sister Anna to the blog. 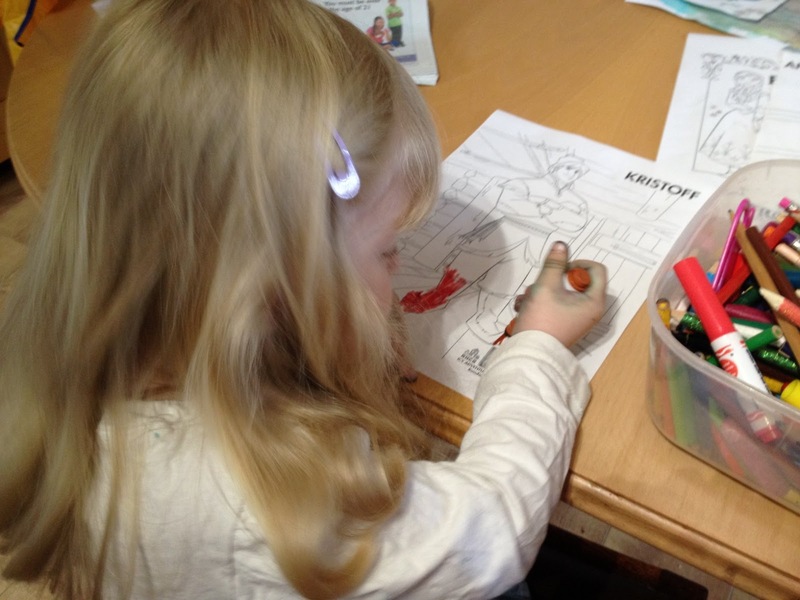 She has a fantastic post to share all about their Disney Frozen themed day. Since we got Frozen on Blu-ray, the girls have needed to watch it approximately 289379843 times. So when I wanted to make a themed day of activities for them to finish up the school holidays, it was an obvious choice. A bit of thought, and some time on Pinterest with words like 'ice' and 'snowman' and 'reindeer', and here's what I came up with. This is the activity that needed the most preparation. I mixed up some water and food colouring, and froze it overnight in a bun tray (an ice cube tray would have worked better but I don't have one). Then I gave the girls some paper and let them have it. There was a small amount of complaining that the ice was cold, but that didn’t last long. The pictures were lovely and watercolour-y, and they both enjoyed mixing the colours. The black, green and blue stained everyone’s hands something awful so maybe we should have done this last but no matter. After a while little fingers got too cold so I put the tray back in the freezer for another day, we scrubbed our hands and moved on. 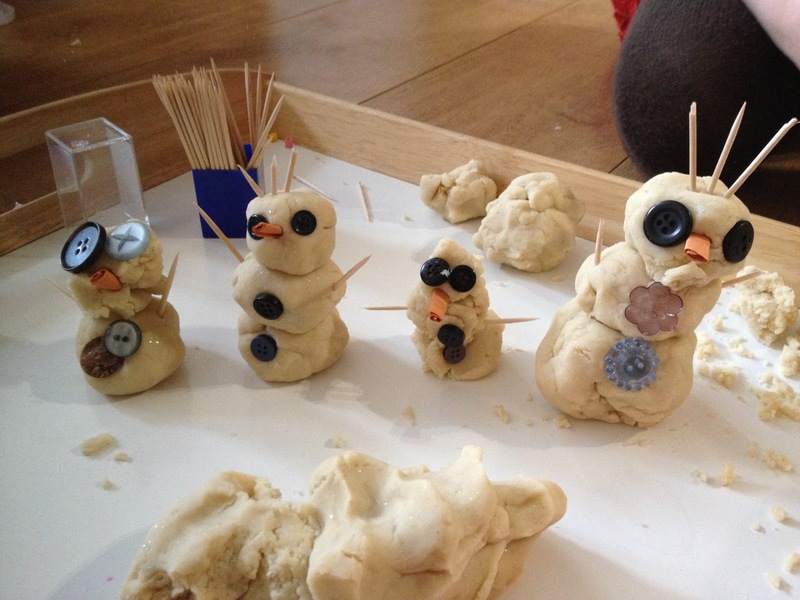 I made the playdough the night before, using this great recipe - no cook playdough recipe. I didn’t add any colour so it just looks like dough – I’m not sure how you’d make it properly white, maybe using a different kind of flour? No one cared, anyway. I also supplied some buttons from my button tin, some cocktail sticks for arms, and some rolled up bits of orange paper for carrot noses. 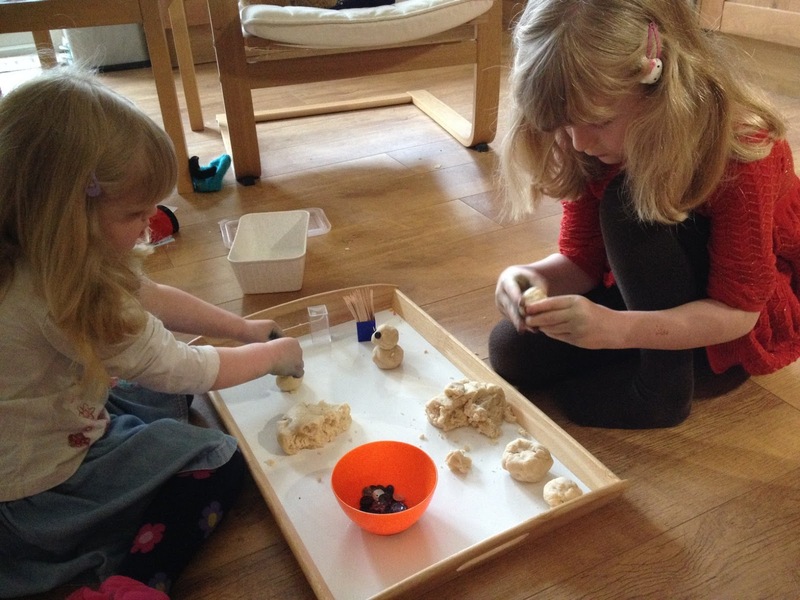 This activity was a big hit, and the bowl of buttons/sticks/noses has become a permanent playdough accessory (Emily is always asking to ‘make Olafs’). They made a whole line of snowmen, and we had to find a picture of Olaf on my iPad so that Laura could make hers as close as possible. Next up was the easiest one, Frozen colouring pages and print-outs. These can be found all over the web – it seems Disney was quite liberal with them. After this it was time for lunch. 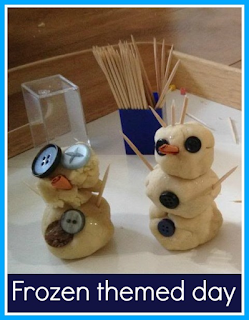 I’m afraid to say I didn’t get creative with that; there are some lovely snowman-shaped sandwiches on Pinterest but to be honest I couldn’t be bothered, and carrot sticks would be a good snack choice but no one but me would eat them. So we just had our normal lunch, I’m afraid. This was also very popular. I cut up a cereal box, first of all cutting some long narrow pieces to make two headbands. 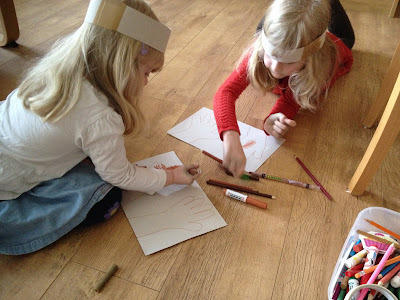 Then I drew round the girls hands on the flat side of the box, and let them colour them in with lots of different shades of brown. Cut out the hands, tape them onto the headbands, and there you go. Two little reindeer. The last item on my list was of course a viewing of the film, so a popcorn snack to eat while watching it seemed like the thing to do. 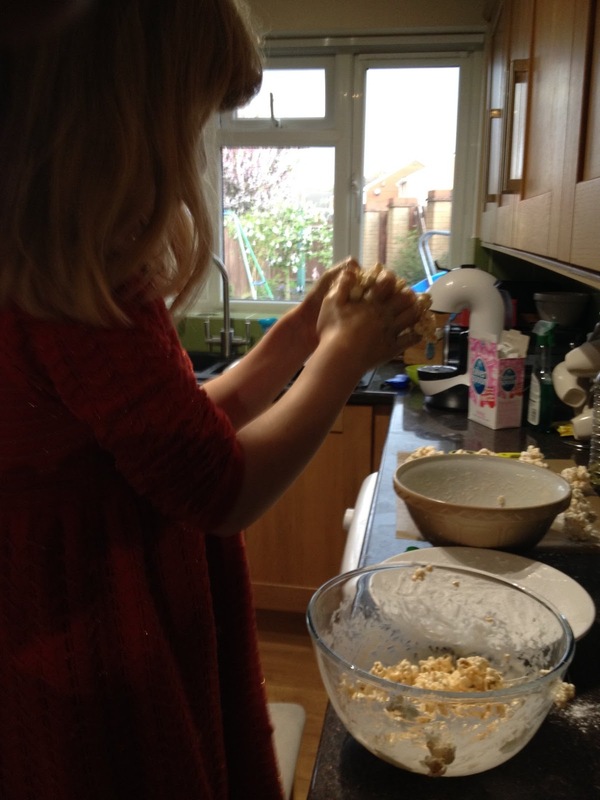 We made popcorn snowballs from approximately this recipe - Popcorn snowballs. Since it’s an American recipe using packet sizes I had to guess at quantities. I used a whole bag of marshmallows and about two tablespoons of butter, melted it all together, and mixed in a bowlful of popcorn. 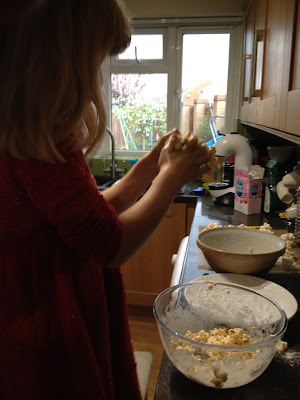 Then we attempted to roll it into balls and roll it in icing sugar. But oh goodness me it was sticky. So, so sticky. You had to really squash it together to make it into balls, then it stuck to everything and the icing sugar didn’t take much of the stick off. Everyone got very frustrated and I ended up doing most of it. I don’t know if I got the quantities wrong or if it would always be like that. It did set harder after a while but they were still pretty sticky when we were eating them (fortunately, it’s the kind of sticky that washes right off with water). So then it was time to put the film on, while I tidied everything up. So we all had a good Frozen day. Doing the themed day was a certain amount of work, but thinking of the ideas was also fun, and it kept everyone happily occupied nearly all day. I will definitely do another, with a different theme, next time we have a spare day like that. 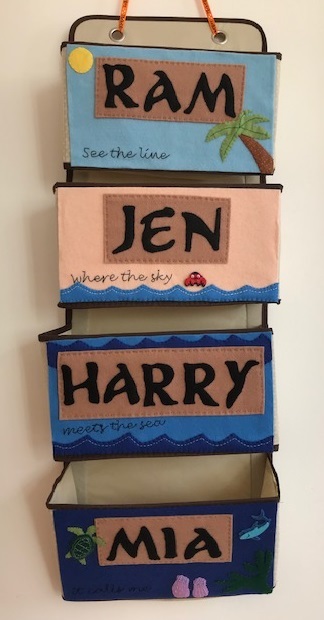 That is such a cute idea. My daughter would love this! Aww! How fantastic! 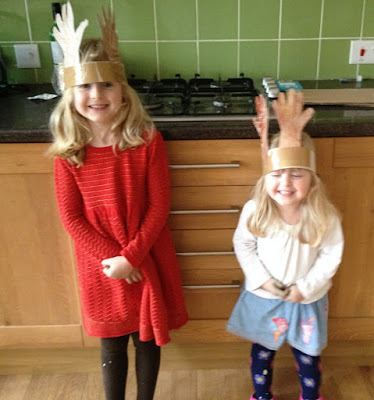 My girls love Frozen and would love a day like that! This is fantastic! A whole Frozen themed day, Ethan would live it! 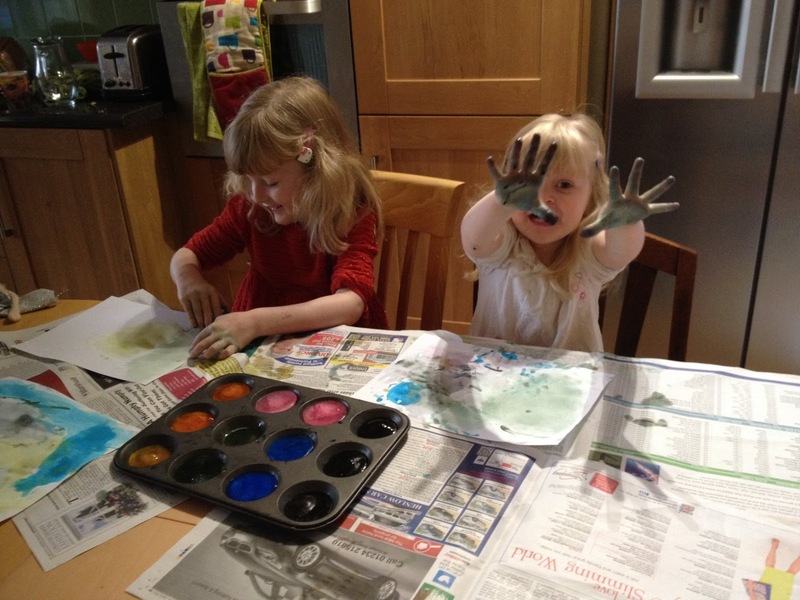 Some fantastic ideas, we'll definitely have to try ice painting one day! When are children old enough for Hama beads?